One of the things I loved to do as a kid was listening to “Fireside” Alan Maitland read “The Shepherd” on CBC. Here’s my contribution to the storytelling tradition. My father outlined the main events and characters of this story. Along with his copy of “Spon’s Own Mechanics Manual”, he gave to me the task of writing this Christmas tale. Here it is with his best wishes, and mine. That night, we could hear my parents arguing when we were supposed to be asleep. My mother was quiet. We kids slunk back to our beds. It was winter of 1968, just before Christmas. We lived in the small village of Riverloft. There were only two things to do there in winter time, as far as I was concerned. The first was playing hockey on the pond behind the meat packers. The run-off water from the place created the perfect rink and we skated there every day. The second thing to do was a new thing as of that fall, for the river that gave our village its name had recently been dredged and the dam fitted with a new fish-ladder. I loved to fish, even more than I loved playing hockey. Even with the weather below zero, I’d stand for hours fishing along that dam, catching trout, bass and, once last spring, a massive salmon. My dad reckoned it was close to fifteen pounds. I’d had to climb right into the river up to my chest to land him. It had been the happiest moment of my twelve year lifespan. And now I was faced with Christmas holidays shut up in a stuffy old house with my kid sister. I couldn’t sleep that night. The wind knocked the long branches of the weeping willow against the window pane. The radiator pipes made a knocking noise that was even louder than usual. All I could think about was something my dad had said, just after I’d landed that salmon and lugged it home. Once in a lifetime? I sure hoped not. I fell asleep for a little while, but the knocking of the branches on the window grew more insistent and I woke with a start in middle of the night. The only thought in my head was about that fifteen pound fish, and how there might not be another one like it. I climbed out of bed and crept over to my dresser. I opened my little box of fishing tackle and pulled out an old Altoids tin. In it was my secret weapon – a set of glow-in-the-dark sinkers. I didn’t know how they worked, but old Mr. Wilson at the pharmacy had given them to me last month – some kind of chemical reaction, he said. He said not to tell anyone about it, and that only real fishermen would ever understand. All you had to do was drop them in water and they would glow bright as could be. Fish couldn’t resist them. I had to try them. I pulled on a heavy sweater and jeans and two pair of socks. I snuck downstairs and into the back porch where all the coats and boots were kept. The noise of the wind helped to cover the sound of the lures tinkling around in the little tackle-box in my pocket. Once outside, I pulled my cap down low over my ears and took off at a sprint for the dam. The moon was high in the sky and it didn’t even feel cold to me. I could practically see myself reeling in a big whopper and landing it on the riverside. Only a real fisherman would understand. I stood there fishing until my euphoria started to wear off. They weren’t biting and the glow-in-the-dark light sparkling under the water had failed to attract any bites. My eyes began to wander. I noticed a flicker of light up on the hill, in the church yard. It was snowing softly and I blinked the cold flakes off my eyelashes, shaking my head. The light flickered again and I heard a sound carried down to me by the wind. It sounded like a little flute playing, far away. I reeled in my line, set my rod down, and, drawn by the strange music, climbed up the hill towards the church. It was the same one that we went to every Sunday, where we sat in pews and were made to sit still until the music stopped. It was an hour-long punishment where even the windows were frosted over to ensure I couldn’t look down the hill at the river. The flickering light had stopped by the time I got to the graveyard beside the building. We used to play hide-and-seek there after school sometimes, but it was a much different place at night. Not scary, really, but certainly different. The moonlight cast long shadows from the gravestones across the white snow. The wind made a whistling noise through the skeleton-like trees overhead. A shiver ran down my spine and goosebumps crept up my neck. I looked down in the snow at my feet. A little gravestone had been recently scraped clean, and a little recorder flute had been set down on it. Not thinking, I picked it up, and as I bent down, I noticed the name on the stone. With the recorder still in my hand, I stood up straight with a start. I was well and truly spooked now. I heard a noise behind me, over by the church, the sound of a door slamming shut. The wind? I didn’t know. I didn’t want to look. I dropped the recorder to the ground and it broke into two pieces against the stone marker. I ran as quickly as I could back down to the dam to retrieve my rod, cursing myself for having left it there. I snatched it up from the snow-covered cement, intending to run straight home with it, but I had forgotten about my tackle box which I had left beside it with the little Altoids tin lying open beside it with the sinkers in it. I kicked it with my foot and it fell into the water, the sinkers in it shining brightly all the way to the bottom. I tried to grab it but I slipped. I lost my balance, flinging my arms in the air. My fishing rod flew through the air, landing with a splash a split second before I did. The water was too cold to feel. I was too terrified to realize that I was going to die. The current grabbed hold of my wet clothes and swept me over the dam. I reached instinctively with my fingers for any hand-holds, but there was nothing, nothing, nothing, only wet slippery rocks. And then, suddenly, just before I was about to drop thirty feet to be smashed on the rocks down below, my right hand caught on the lip of the fish ladder. I clung there for a second, dangling by one arm, twisting painfully. I tried so hard to hang on, but it was slippery, and I was too weak, my clothes too heavy. But I did not crash to the rocks down in the swirling darkness below. A hand grabbed my wrist with an iron grip and I felt my shoulder pop out of joint, the pain jolting me out of the stupor of coldness. The hand pulled me over the side of the fish ladder and I felt myself thrown heavily over a broad set of shoulders. I tried to stay awake, but the world had gone black. I heard a voice in my ear before I lost all senses. It was barely a whisper, but it was full of despair and pain. I awoke slowly to the sound of what sounded like the radiator pipes banging. My vision was blurry and my shoulder hurt like the devil. I tried to say something, but it came out like a whimper, like a cry. The sound stopped. It couldn’t have been radiator pipes, because they banged all night long. I turned my head to look, my vision beginning to clear. My whole body was prickling with pain as the numbness started to give way to the warmth from whatever I was lying beside. “What did you say, Tom?” A man’s voice asked. I looked up with a start. He was standing over the pot-bellied stove with an armload of wood, and the sound of him shoving wood into the firebox was just the same as the banging of radiator pipes. His face was thrown into stark relief by the flames. Moonlight shone almost horizontally through the window. It was Mac Royal. I recognized him instantly, though he looked tougher and paler than the last time I’d seen him. We used to call him Uncle Mac. His son Miles had been like an older brother to me. I could remember him teaching me to ride his bike with no hands. They said Uncle Mac had killed his son and buried the body where nobody could ever find it. “My fishing rod,” was all I could say. Mac Royal the murderer smiled. It was the warmest, friendliest and saddest smile I had seen in my life up to that point and ever since. He smiled with his whole face, not just his lips. His eyes twinkled and reflected the moonlight and the fire in the stove seemed brighter because, just for a moment, he glowed like a saint. “I got it, Tom. Don’t you worry about that,” and he pointed over to a corner where I could see my rod and tackle box in the shadows. It was then that I realized where we were. This was the garden shed behind the church, which used to be a coach house in the olden days, but had long since been relegated to a tool shed where shovels, rakes and mowers were stored. I hadn’t even known there was a stove in there. “Thanks.” I couldn’t think of anything else to say. We were both quiet for a bit while he finished with the fire. “You getting’ warm yet?” He asked eventually. I started to nod, but it sent a fresh stab of pain through my shoulder and I winced, crying out. I breathed in. I breathed out. Snap! He tugged hard on my arm with his right hand whilst gripping with his left. The pain in my shoulder multiplied a thousand times and then, miraculously disappeared almost entirely. Only a dull throbbing remained. “Whippin’ trouble,” I said, smirking, imitating my dad. Mac Royal laughed, throwing his head back, his teeth spread wide in a grin for an instant before the sadness found a way back to it, clawing back into the skin around his eyes. A tear welled up in one of them. He was standing in the doorway with it half-way open. The snow was swirly around him like a ghostly mist. His face looked white and pale in the moonlight. “What did you say?” he asked, his voice tight and pinched. I pointed over to far side of the church where I had seen the flickering light earlier. I didn’t understand. “Wasn’t that you…” I began to say, but Mac was already running into the night, staggering like a drunken man, or one about to collapse. I followed as quickly as I could, my body still tingling as blood worked its way back into my limbs. I found him by the grave, a shaft of the setting moon’s light illuminating his face for a long moment before it disappeared into the clouds. He was on his knees, sobbing, with the two pieces of the recorder in his hands. He carefully laid the pieces of the recorder down onto the stone, just below the inscribed name of his son. I struggled to reply, but said nothing. It was quiet except for the wind. The house was cold when I opened the door. It was still and quiet away from the blowing wind. I peeked inside the kitchen to check that the coast was clear and then went back to the porch. The door had blown back open and I moved to close it, looking outside for Mac, but he was already gone. My bed took a long time to warm up, but despite that and the knocking of the radiator and the dull throb in my shoulder, I fell into a deep sleep with no problem. Next morning at breakfast my parents were cheery and bubbly. It seemed they were trying to make up for last night, trying to restore some Christmas spirit to the house. I turned and ran out into the porch, hauling on my coat and boots and flying out the door. I high-tailed it as fast as my legs would take me, all the way along the river and up the hill to the church yard. It looked different during the day. I followed my tracks up from the night before and over to the little gravestone. I knelt down in the place where I had seen Mac Royal kneel down crying the night before, and I felt my own tears start to run. There on the gravestone, where I had expected to see the broken pieces of a recorder, sat my little Altoids tin. I opened it hastily with trembling fingers. I really wish we had good theatre reviews here in Northumberland. I think there is a real art to getting it right, especially for community theatre, and we really need that, not only to encourage the theatre companies and keep them honest, but it helps theatre-goers to better understand what they are experiencing. Tomorrow is the memorial service for VOS founder Ruth Harcort. She directed and played in many shows through the years for different theatre groups. Here is a review of a show she directed – the Northumberland Players’ production of “The Fantasicks” from The Port Hope Evening Guide, October, 1989. Click to view full size, there are 2 image files. Now THAT is a good review, written Jonathan Lock, two and half decades ago. He provides an excellent look at at the actors’s work, how they were directed, even how they had improved from past performances. There’s good critique of technical stuff, all fixable, nothing too biting or nasty. Certainly nowhere is there this idea that we should celebrate everyone and come on out to support everyone because they worked hard. That’s a ridiculous sentiment that might wash with youth productions or other participation-based stuff, but theatre patrons pay real money and they deserve to get good value. The fact of the matter is that theatre is competing with everything other form of entertainment, including TV and Netflix, not to mention a plethora of choirs, bands, dance, and other performing arts events. We need to have someone writing about what’s really happening on the stage so that people can interpret some of the things that they may have missed, or that they simply couldn’t appreciate. The fact of the matter is that on any given weekend we have all kinds of local theatre choices, and if we simply had someone who knew what they were writing about, and who was able to elucidate their opinions without obvious bias, then both the audience and the performance companies would be much better off. 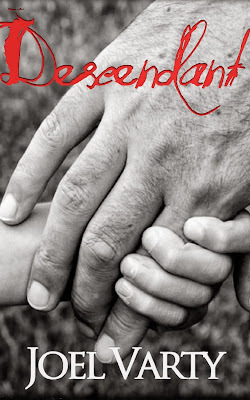 This weekend my second novel Descendant is free from the Kindle store. Take this opportunity to grab an exciting novel that will keep you turning the pages. Six-year-old Laurel is a little boy who shows up in Manchester, England under the watch of Constable Phil Shiller. Vincent Carpenter is a former Special Forces operative. He and Laurel meet at Manchester airport as Vincent is attempting to prevent a terrorist attack. The target is the boy. Vincent, we discover, has been his protector for a very long time. As they attempt to outrun their pursuers, Vincent begins to remember his past, and Laurel takes him there with his every touch. Check out this great novel here! For the past three weeks I have had the privilege of singing in a combined mass choir filled with folks from Toronto, Kingston, and Cobourg to celebrate the 60th anniversary of the Queen’s coronation in 1953. June 2nd was at Christ Church Deer Park in Toronto, June 9th was at St George’s Cathedral in Kingston. Both venues were beautiful to sing in and completely sold out. This weekend we finish in Cobourg at Trinity United Church, which I am happy to call home. It’s also sold out, so that should be pretty cool. There are some great pieces in the more than 30 pieces that we will perform, and I have never heard the Concert Band of Cobourg sound better. I’ve been doing theatre for a while. This is nothing like anything else I’ve ever been involved with. For instance, I wear tap shoes… check it out on the Spamalot blog. 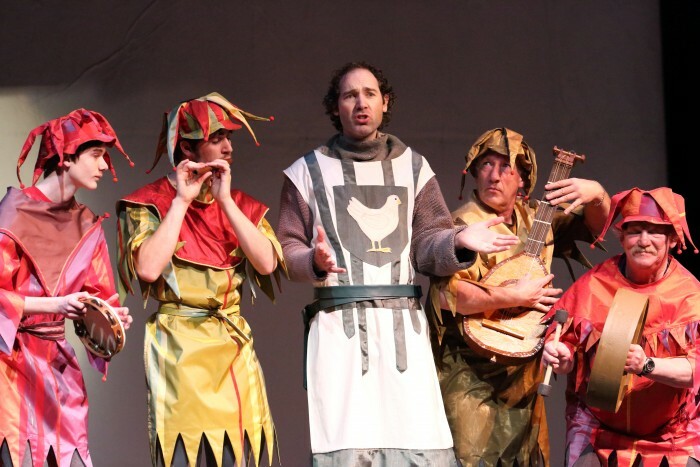 I’ve been thinking quite a bit, in preparation for dealing with the character I am playing in Spamalot, Sir Robin, about how Monty Python actually works. Why is it so funny, and why is it so damned relevant? 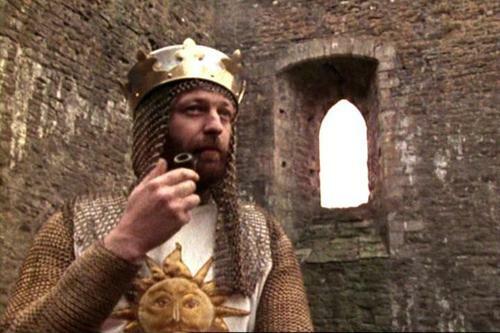 I think we need look no further than The Holy Grail‘s Graham Chapman for that, and also my Uncle Exton. You see, I didn’t grow up watching Monty Python, I only experienced it through my father’s older brother, my Uncle Exton. Yes, I understand that his is a most unusual name, making it thus more awesome to bring up in conversation, though this isn’t one. However, he used to quote Python laughingly time and again. Songs, skits, voices, funny walks, he did it all, falling over himself laughing, and then apologizing to his wife, my Aunt Melba, for embarrassing everyone. The funniest thing I can remember was looking through a book with my cousin that held God’s Report Card (Latin: 100%). My proper introduction to Monty Python came in a roundabout way when I hooked up with an English Girl (now my wife) who adores John Cleese in Faulty Towers. 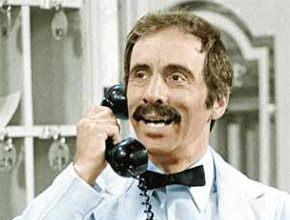 Now we lovingly quote Manuel whenever someone says something boorish or with too much assumed authority. I then started watching bits and pieces of sketches here and there on YouTube, rented The Meaning of Life from the video store, and eventually, after being cast as Robin, watched The Holy Grail on Netflix. And there you have the single most effective humor device used within Python. I call it the Semi-Calm Refusal to Comply, where the protagonist is denied his rite of passage through a given scene by a semi-calm antagonist. Picture the 5-Pound Argument scene, the Black Knight, and others. They all employ the Semi-calm Refusal to Comply. Delightful! But why is it funny? “It isn’t.” Oh, shut up. I leave you now with a portion of Cleese’s eulogy for Graham Chapman. “And I guess that we’re all thinking how sad it is that a man of such talent, of such capability for kindness, for such unusual intelligence, should now so suddenly be spirited away at the age of only forty-eight, before he’d achieved many of the things of which he was capable, and before he’d had enough fun. 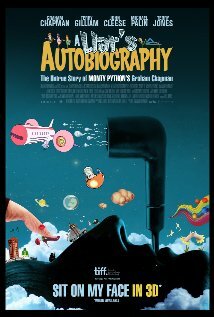 Incidentally, Chapman’s animated, factually incorrect biography was released last year. I think we can learn something from that, only I’m not sure what. Always look on the bright side of death…. As the title character, Alex Saul does not simply occupy the stage, she elegantly erupts from it. She spends every millisecond of her time holding court in her prison room of a house completely in character; from her fidgeting fingers to her mischievous eyes, to her lusty flirtations, to her attentions to her playthings. Everything is askew in this world, indeed even General Gabler haunts the place at an angle, and that keeps everything on edge on this set, especially Hedda, and this is one of the reasons that she is so eminently watchable on-stage. She doesn’t stand or sit or any of those ordinary things, she flounces, she perches, she hovers, she arcs. Indeed, you may try to pry your eyes away from her, and if you manage to you will have been more successful than I was. I wasn’t sure whether to feel sorry for her, be turned on by her, or wish that would just she would shoot something. The hysterical mad-woman is a common 19th Century theme, with our poor pregnant darlings either filling their pockets with rocks and leaping into the Thames, or relegated to the attics of various bourgeois households, watching the wallpaper curl and fade. Ibsen is unique not only in his prescience of what the 20th century will hold for mankind, but also by his exploration of what the experience of being one of these women actually is. She’s caught between classes, she’s without vocation, she’s clever, and she dreads what will happen should the walls of her upper-middle class prison collapse upon her should a lump appear in her belly. So, yes, Alex Saul as Hedda is worth the price of admission and more all on her own, but what makes the piece so memorable for me are the tableaus that director Bea Quarrie sets up for us to ponder over. When David Russell as Eilert Lovborg crosses to stage right, professing his vision of the near future through the metaphor of a woman, with Hedda perched with her luscious back to us on the chaise longue at the left, and the two bumbling fools in the centre giggling on the sofa, it’s hard not spot the allegory. The other moments I will leave to you to find, since they are well worth watching for. When it comes to the rest of the ensemble, I think one could listen to Christopher Spear’s Judge Brack for hours without being bored, his voice is that good, so that we might almost forget to hate him as much as we are beckoned to. Mark Paton, too, is wonderful as George Tesman (sometimes Georgie, often just Tesman), and he holds us on the verge of laughter for so long that I couldn’t help but cackle at him at times, though nearly everyone else in the audience was too demur to follow suit. His relationship to his aunt Juliana, played by Jennie Ryan, is delightful, and those few minutes before Hedda appears in the morning really frame the whole piece well. Russell as Lovborg is complicated – he is like watching a living metaphor strutting about the set, chanting at Hedda, and serving as the object of her desire, I think he wrangled with the man between the angel and demon adroitly and with class. Kait Dueck as Thea Elvsted is, I think, our largest source of melodrama here, and her voice calls out louder than anyone else’s on-stage, daring us to tear our eyes away from Hedda for a moment to recognise this woman for her own courage and values, which is admirable, but quite impossible, I dare say. The moments with Hedda and Berthe, played by Susan Gontier, are really, really cool. We may not understand Hedda as well as we might like to, but we damned well think we understand Berthe, and I felt something rip inside me each time she was summoned, or entered in darkness to do her assigned duties. The lighting, too, was rather moving as the set was washed with morning sunshine, or cloaked in darkness to reveal only flames, at one point. I found myself wishing for a sunset or the rosy pink of a clean, clear dawn, but I don’t suppose the General would have approved of that. We are treated at times to the music of R. Murray Schafer, and, along with all the other little bits and pieces, another dimension is added for us to grapple with. His harping is the thing that breaks the grounds of our collective psyche, I think, which is almost a necessity with this material. I don’t think I can separate the story from the music in my mind, at this point. In costumes, I can only say that the silk dress which adorns Hedda is such a marvellous piece of art that I can’t really describe it. I’m a man that doesn’t understand that sort of thing very well. However, I do recognise when my sensibilities are being played upon, and kudos to whomever decided to redo that piece of the puzzle, because it drew Hedda into her surroundings and locked her, I believe, incontrovertibly inside them. The play is only on for two more weekends, so you’d better go and see it for yourself, otherwise you’ll just be left wondering, and you’ll have missed out on a piece of theatre that you can’t expect to have known was coming, and you won’t be able to predict will come again. Tickets are available at the box office, or over the phone, details at the Peterborough Theatre Guild website. 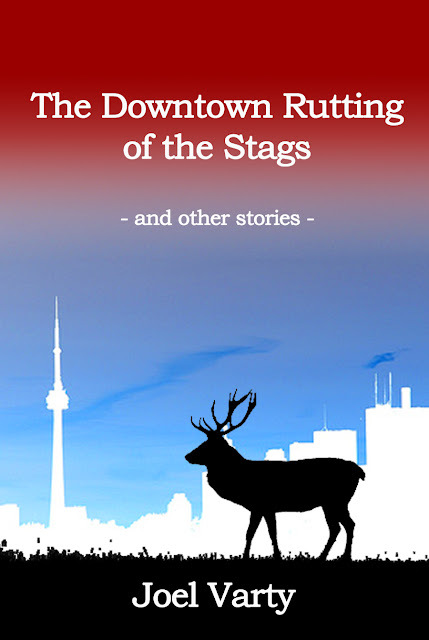 Now you can get five of my short stories as part of this excellent collection, starting with The Downtown Rutting of the Stags. Give it a read, and you won’t be disappointed!